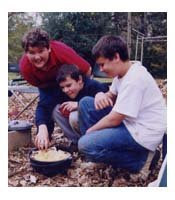 My boys like to cook outdoors in the Dutch Oven. That's how they like to make chili, but I think they're doing chicken and dumplings in this shot. Everything tastes better cooked outdoors and that includes chili. The good folks in Asheboro, NC know that, so they are having a huge chili cook off this Saturday (April 18, 2009). It's too late to enter this year, but that's fine. You can drop by and enjoy the fun street festival with lots of music and good food. I'm very pumped up about the festival, because I get to help judge the chili entries. Talk about a sweet or HOT job. I am definately wearing loose pants, because the last I heard, they have 40 entries. That's a lot of chili to check out. I am a chili fanatic and love to make and eat all kinds of chili. About the only chili I don't like is stuff named "chili sauce" in a can. What is that? It looks and tastes like dog food. No go on canned chili sauce. If you've never made chili or don't live close enough to get to Asheboro this weekend, I have a very easy starter chili recipe. It's called Taco Soup, but it's really just a variation of chili with a little Mexican flavor. The flavor is mild, so it works out for groups where you may have folks who just don't "get" hot chili. If you can get out to Asheboro, it's going to be a blast. They are calling for wonderful weather, and everyone is getting excited. If you see me there, tell me "hi." I enjoy meeting folks who check out my barbecue blog and web sites. I should be in the judging area around 3 p.m. Otherwise, I'll be wandering around enjoying the Asheboro festival.